Content Publishing System | "Getting a quality website is an investment not an expense." This chart shows how content is created. First comes a strategic plan. Management must decide what is the best strategy to attract visitors and search engine attention. After they have a strategy, a content plan is created. The content plan contains information about the existing content, new content, link bait content and how the content is displayed on the website. After the content is published, natural links, and linking people are involved. 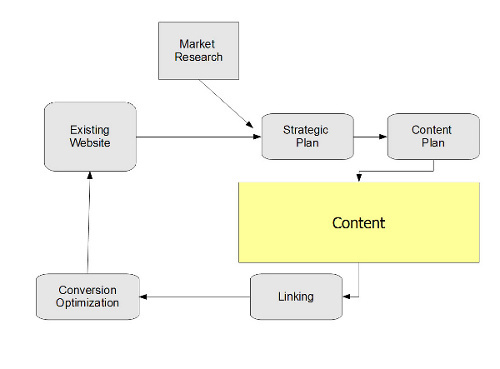 The conversion optimization is actually in the process of the rough draft of the content. The conversion rate people are advising the content people about the layout of the content. After the cycle runs, the strategic plan people contact market research and start the cycle over.